Take a skillful producer, one of the most reliable years in memory, the worlds' greatest variety, a good vineyard and you can't go wrong. Although Saering does not have the punch of its' neighbors Kessler and Spiegel, the accessible style makes this wine a real charmer. 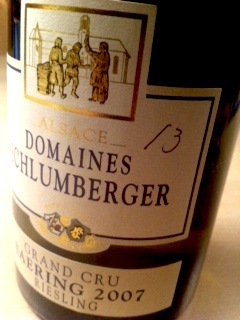 2007 Riesling Grand Cru Saering from Schlumberger in Geubwiller is medium yellow. It has a typical and attractive grape aroma of rubber, lemon peel and fried apple pie. The taste is medium-bodied with a slightly agressive acidity, smooth and attractive fruit and apples in the aftertaste. Price: €18.